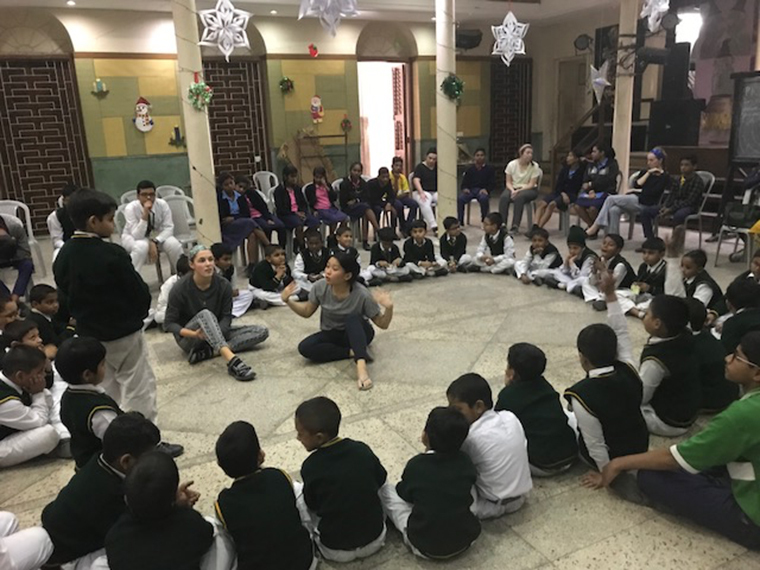 Iona College students speak with students at a Christian Brother school in Kolkata. Just over a month ago, my team of 11 girls and two professors landed our feet back on American soil after spending ten days immersed in the joyful chaos that is Kolkata, India. The girls and I prepared for months to make the journey and serve with our whole hearts. Our focus for this trip was the two feet of social justice- direct service and advocacy. I think I can speak for the team when I say that the two rely on each other. We saw this in our work with the Missionaries of Charity and the children from St. George's School and St. Joseph's College. With the Missionaries of Charity, we each served at one of three houses. Some, including myself, served at the orphanage, a few served at a center for children with physical and mental disabilities, and others served at the house for the sick and dying. Each afternoon, we departed to our different locations. In the mornings, we collaborated with Br. Steve Rocha, CFC, and the PRATyEK/ Nine is Mine project, focused on 7th and 8th graders, talking with them about the Sustainable Development Goals and ways that they can advocate for their own rights. 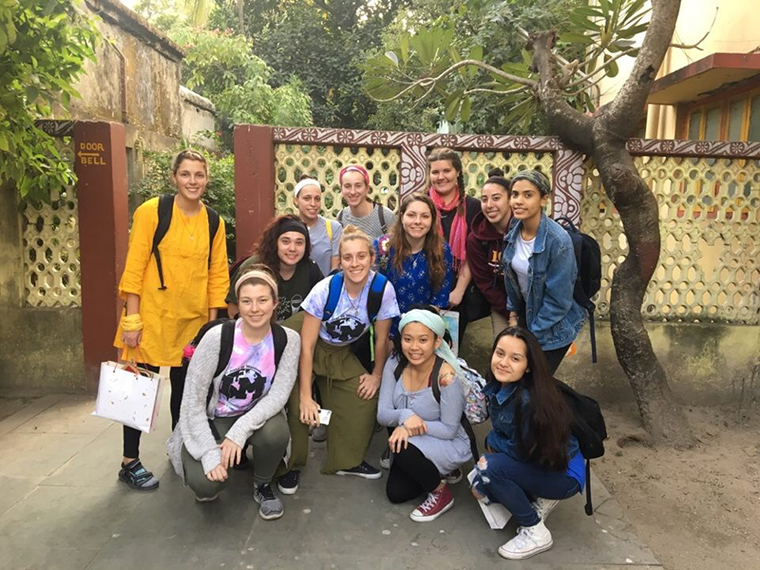 Photos from Iona College's Winter immersion to Kolkata, India. We also discussed ways the goals are reflected in the subjects the children study in school. The most astonishing thing that came out of our interaction with these amazing kids was that we thought we were going there to teach them about the goals. However, it was the kids who ended up teaching us. Not only did they offer us a newfound sense of joy, they gave us a new perspective on children's rights. In the United States, if you asked just about any 12 or 13 year old boy or girl what the Sustainable Development Goals are, they would likely have no idea. Their enthusiasm and passion was overwhelming. They also taught us the importance of knowing your rights. They explained to us that one of the reasons people are trapped in poverty is because they do not know their rights. They do not know that they have a right to education and a right to clean food and water. All of these kids are surrounded by a broken system but themselves are a part of a new system. At the heart of this new system is advocacy. At first glance, we weren't sure how our work with the SDG's and with the Missionaries of Charity would intersect, but as it turns out, they are heavily intertwined. It is easy to discuss the ways in which children's rights need to be fulfilled, but who is speaking for the voiceless, homeless woman sleeping on the curb? There is no stereotype when it comes to who needs to be advocated for the most. Rights are rights, no matter the age, gender, or socioeconomic status of an individual. 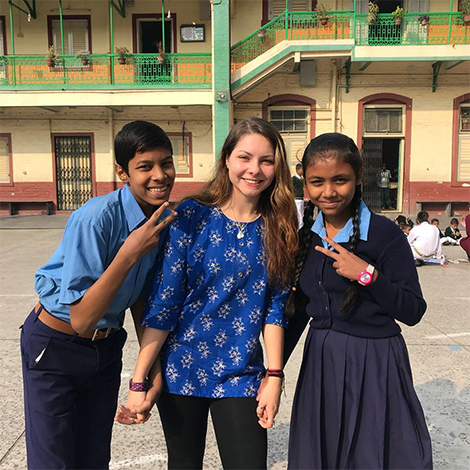 Students in Kolkata pose with an Iona College visitor; the Iona College India immersion team. The work we did with the kids in India was so important because it empowers them to use their voices and know their rights. That groundwork was easy because the kids were so enthusiastic The hard part for us as advocates, is to continue that work once we are stateside. Here, it is not that kids don't need to know about their rights. They do! It just isn't a conversation that is often had with kids. One of the members of our team mentioned that the Sustainable Development Goals could be incorporated into activities with kids here as well so that they know their own rights, as well as the responsibility they have to advocacy for the rights of other kids too. Advocacy has become an essential part of my daily life because I now have an awareness that not everyone knows their rights. This awareness has made myself and my team even more passionate about making advocacy a daily priority. It is another point of connection when we meet other humans in their moments of need, and what could be more beautiful than that.